I remember the first time I ever tried Mediterranean food. I was in college working at a breakfast restaurant and my coworker kept telling me about her favorite local restaurant that served a killer vegetarian appetizer platter. Up until that point, I had literally never heard of falafel or pita and had yet to jump on the hummus bandwagon. It was all a mystery to me. But that all changed one day after work when she convinced me to join her for lunch. One bite in and I was ruined. Since then Mediterranean has become one of my absolute favorite cuisines. I practically have hummus pumping through my veins at this point. Though I have mastered the art of Vegan Gluten-Free Falafel, I’ve been craving a falafel burger these days. There’s something so substantial about a burger, and the flavors of Mediterranean cuisine lend themselves perfectly to toppings and sauces galore. This recipe is simple, requiring just 7 ingredients. Plus, it’s seriously well spiced with infusions from both garlic and cumin for a tangy, smoky flavor that I absolutely adore. They’re also baked for a healthier touch, though I do prefer giving them a little sauté beforehand to form an extra crust on the outside. I’m kind of a texture snob. These burgers are super versatile! 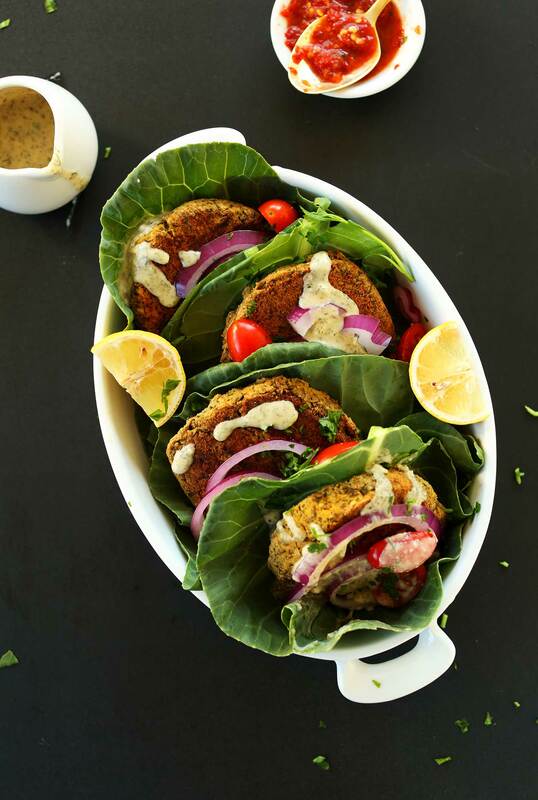 Serve them on pita for a more traditional falafel feel, atop greens for a seriously substantial salad, or wrapped in chard for a naturally gluten-free option. As for sauces, hummus makes a lovely touch! Otherwise, my go-to Garlic Dill sauce is magic. You really can’t go wrong. I suspect even carnivores would dig this dish. It’s so hearty and substantial with nearly 10 grams of protein and 5 grams of fiber per burger! That’s a seriously satisfying and healthy meal even picky eaters will love. If you guys make this recipe, you know the drill: Let us know! Take a picture and tag it #minimalistbaker on Instagram so we can see! Or PIN it to save for later. I always love scouring my Yummy Eats board when our meal plan is looking grim. Or, when in doubt, 31 Meals to the rescue. Cheers, friends! 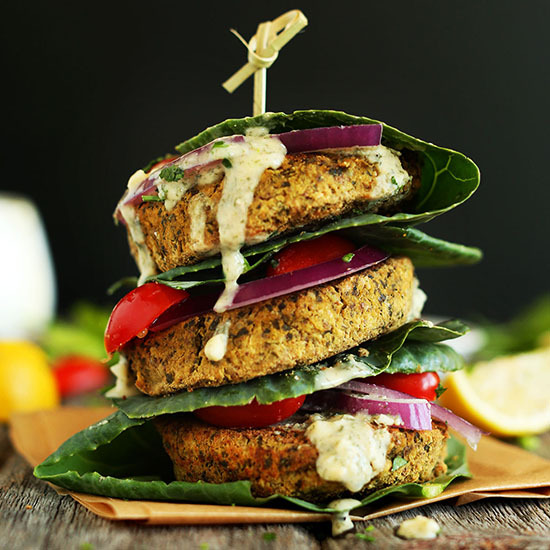 Healthy, 7-Ingredient V GF Falafel Burgers! Simple, flavorful, and perfect with pita, greens, or atop a salad! Add parsley, garlic, lemon juice, cumin, and a healthy pinch each salt and pepper to a food processor and mix to combine. Transfer to a mixing bowl and add nut meal (or oat flour) and mix again until a loose dough is formed that's firm enough to be handled. Taste and adjust seasonings as needed. I added a touch more salt. Draw an “x” in the dough to form 4 sections (as original recipe is written // adjust if altering batch size), then use your hands to form into 4 large patties (amount as original recipe is written // adjust if altering batch size) roughly 1/2-inch thick. Place on a foil-lined baking sheet and refrigerate or freeze for 15 minutes to firm up. Preheat oven to 375 degrees F (in the meantime. OPTIONAL STEP: For a little extra crust on the outside, before baking heat a large skillet over medium to medium-high heat and add 2 Tbsp olive or avocado oil. Swirl to coat pan, then add falafel. Carefully flip once golden brown – about 3-4 minutes - and then cook on the other side until golden brown as well - 3-4 more minutes. Return to baking sheet to continue baking. Otherwise, just add them straight to the oven for baking. * Nutrition information is a rough estimate calculated without toppings. Hi, can I get a food processor recommendation? 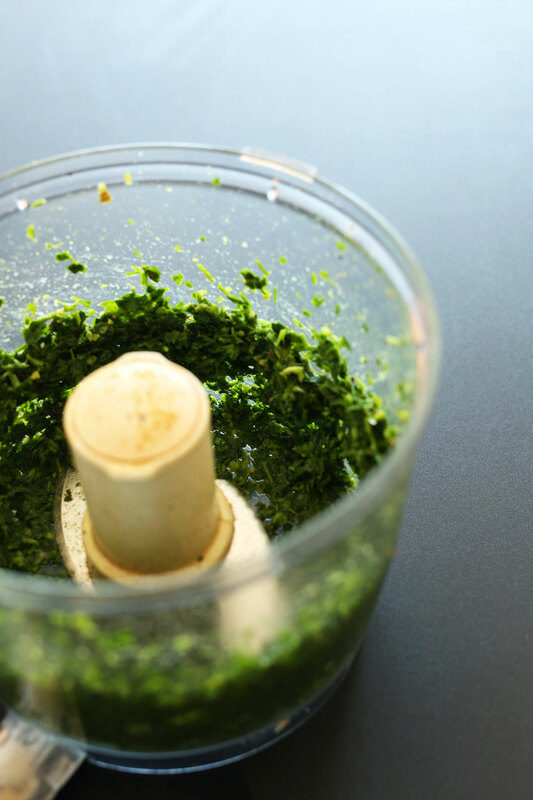 or a way to blend the parsley, garlic, lemon juice step without a food processor? my multi-speed vitamix couldn’t do it. price is a factor. thank you. I’ll be trying the recipe again because I mixed up a few steps, like sauteing the burgers before freezing for 15 minutes. and I just chopped the nuts instead of turning into flour (or meal) . the taste was excellent and i have pictures but obviously not the best, a little crumbly. Hi Paul, this is the food processor we like. Hi Patty, is it possible you didn’t pulse the chickpeas fine enough? Next time, try processing them more and this should help the burgers hold form better. Hi Nathalie, sorry to hear this recipe didn’t work out for you! Did you make any modifications? We would love to provide some tips if you can let us know more about what went wrong. Do I have to cook the chickpeas first if I am using the dried ones? Yes, you’ll want to do that! I like the mix but traditionally falafel use soaked but not cooked dried chickpeas. Cans are good in a hurry but alter the texture a lot. Nuts are an interesting addition, and I some pistachios sitting about. I always put in a lot of fresh coriander as well (cilantro to the US). Sometimes mint as well and green onions. So…WOW! This was soooo delicious. I need to let ya”ll know that I only have a Vitamix (with no pulse feature) and not a food processor so the first part of the recipe was a bit challenging. My parsley liquified. I had to add water so it wouldn’t burn up my blender. Blended till it was green mush but I didnt keep the chickpeas in long. I put it all in a mixing bowl and mashed some of the peas by hand, leaving some whole. I like crisp but was hangry and skipped the saute suggestion. The crisp from baking was just fine. The flavors in this recipe are ridiculous…in a good way. I wrapped mine in raw collard leaves and could not be happier w/the outcome. I made your dill sauce (good lawd this stuff is divine). My only issue is that I should have made more! I am a new fan and will be trying other recipes of yours, Dana. Thank you so much for this. I can NOT wait to make this again. Thank you for sharing your process with us, Tammi! We are glad you enjoyed it! Made this falafel, this weekend. After some research on the net, I took this recipe made it from dried soaked chickpeas, 25% of the chickpeas I left raw, the rest I boiled and followed the rest of the recipe, excellent garlicky taste, and nice texture. I did not back them just on the griddle. I wish I could post a picture. Thank you for this great website, you created. I used more then one recipe of you. Thanks for sharing, Hans! To share a photo, feel free to use the hashtag #MinimalistBaker on Instagram and we’d love to see what you cooked up! Hi Dana! 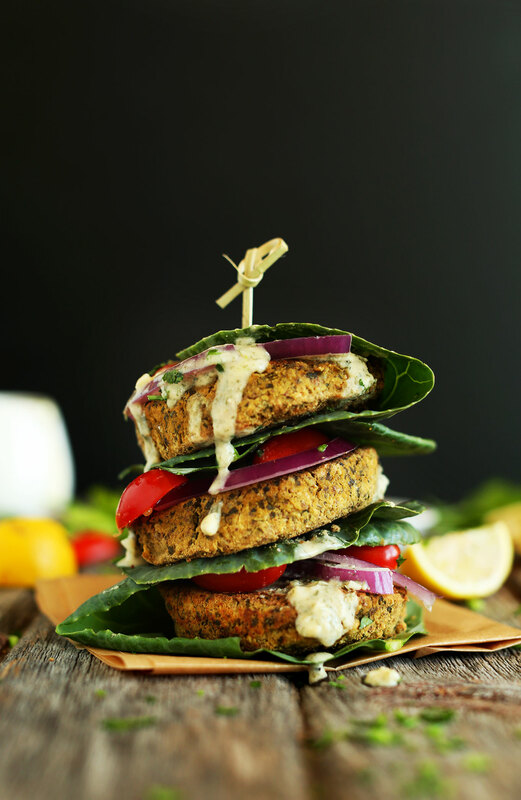 I make your “Easy Vegan Falafels” on almost a weekly basis :) I have yet to make this burger version, and I’m wondering if making the falafel mixture ahead of time and having it chill in the fridge all day would have any negative effect on texture/anything else. Hi Alivia! 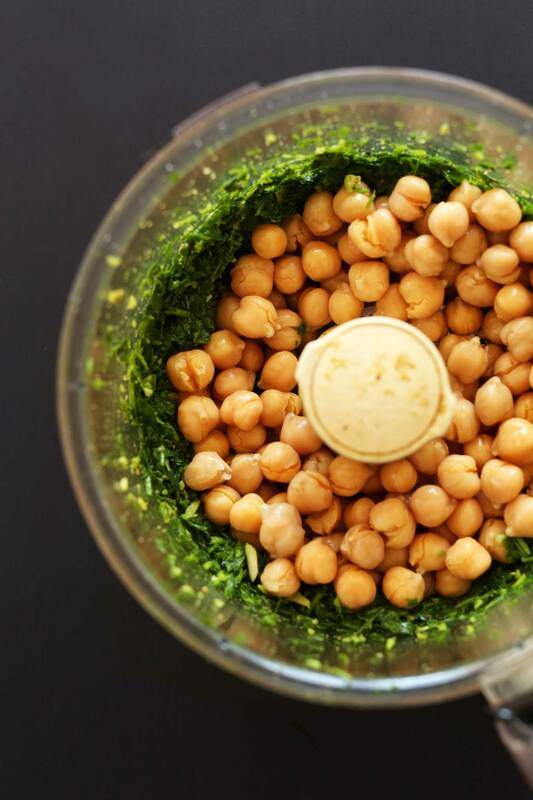 You can totally refrigerate your falafel mixture for later in the day! Hope this helps! I made this and need some help. The flavors pre-cooking were wonderful, but they completely fell apart with cooking, crumbling so much I ended up sprinkling it only a salad. I thought maybe I left out a binder in the recipe, but on checking I followed everything as outlined in the recipe. Love the flavors and so want this to work. Suggestions? Hi Carol! I’m wondering if you didn’t pulse the chickpeas fine enough? Next time, try processing them more and this should help the burgers hold form better. Can I use regular flour without effecting flavor/consistency? I haven’t tried it that way, but it should work! Maybe try oat flour first. i tried this MASSIVE falafel pita for the first time yesterday (all i’d ever tried was hummus!!) with hummus, olives, deep fried falafel, tahini, mediterranean salad- ALL THE FIXINGS. LOVE AT FIRST BITE!! i was thinking “where has this been all my life?? !” i was so happy when i found a recipe by none other than minimalist baker ;) definitely going to try this!!!! This looks delicious! 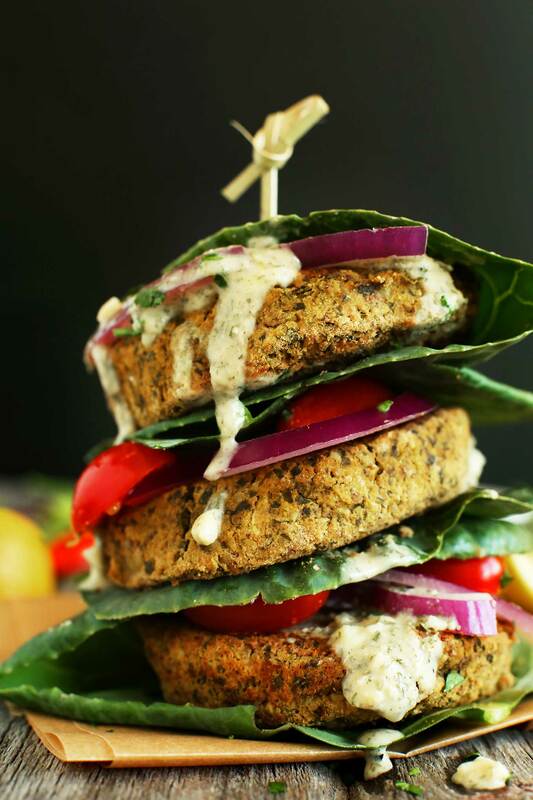 I can’t believe I’ve never thought of making falafel BURGERS?I can’t wait to try it out, thanks for the recipe! I tried these last night. Unfortunately, they totally fell apart and got really dry during the baking process. I thought they would – anytime I’ve tried to make fritter type things, they are a disaster if there is nothing to bind them (like an egg). Shoulda listened to my gut! Glad they worked for others, but I really don’t understand how they would. I had a similar experience – I could barely get them in patties to begin with for how quickly they were crumbling, and they were unpleasantly dry by the time they were done baking. Not sure what adjustments I’d need to make for this to work. I was a little surprised and disappointed, since recipes here never fail me. The taste was good, at least. I made this and it could have been better. I would decrease the amount of lemon juice. The juice of a large lemon was too much. It made the falafel too sour. to clarify any burger suggestions only using chick peas she does not care for black beans. Thanks so much! So appreciate your suggestions! I have tried to read through all of the comments but a few suggestions would be helpful…how well do these freeze after preparing? Out of all of your chickpea falafel or burger recipes, which have you been most successful with moistness and sturdiness and over all flavor if baking and freezing? Looking to make a low sodium large batch for mom to keep in her freezer and pull out as needed…will a reheat in microwave work? Canned beans? blasphemy. Falafel is made with raw soaked beans. I’m partly of Lebanese descent so I’m no stranger to Middle Eastern food. I just pulled these out of the oven (I used 1/2 cup pay flour and fried a little before baking) and they are so freakin good!! Honestly, better than the regular falafel I’m used to. This has a ton more flavor. Thanks for sharing! it was almond based yogurt! WOW…I made these tonight. My body building routine is inviting me to eat more protein. I’m mostly vegan, though crave meat when I can’t get enough protein. I prepared fresh garbanzos today, and then used teff flour and cooked them in an avocado oil greased muffin pan. They came out as perfect little bite sized oven baked sliders. I served them over a bed of cabbage, with a variety of olives, a yogurt based tahini, and a glass of fresh pressed carrot juice…HEAVEN! Thanks for recipe! Hi Dana this recipe looks great! But I just have one question… why is there so much sodium in one patty even without the toppings or dressing? Just trying to stay in a clean eating mode and trying to reduce my intake of sodium as well so that’s why I was wondering. Thank You! I made them and the mixture tastes good but the patties would not stay together and they crumbled into pieces very easily. Not sure what to add next time to have firmer patties? Hi. I tried the printer version content and it’s a blank page. Also tried from my laptop and same story. So it’s an issue in your end. I was nervous about attempting this recipe, but I need more meatless options for dinner. I love street cart falafels, so why not try it?! This turned out SO good! It crumbled a little and was wondering what I can do to have firmer patties next time, nonetheless absolutely delishious. I had it with the garlic tahini sauce from this site and garlic naan BC it’s my birthday and I love naan, lol ❤ Thank you! Wow what a wonderful recipe! I used 1/2 cup of GF oats and just blended it up with the other ingredients… my hands aren’t as able to stir as before. They turned out crispy and look perfect! I made these tonight, and served them on a salad, it was very tasty !! It’s the first falafel recipe I ever tried and it was way easier than I thought ! Thank you for all your vegan recipes !! Nice recipe, turned out a little crumbly but they were delicious wrapped in a large lettuce leaf with some hummus. What am I doing wrong? Completely crumbled as soon as I touched them. YUM. I seared the outside first then baked for 30min, may bake longer next time. I used plain bread crumbs because I didn’t really like the idea of using regular flour, taste wise. I also didn’t make the garlic dill sauce, although I definitely will in the very near future! I used this bottled vegan tahini dressing/sauce (swoons) on a toasted whole wheat bun and a little ketchup on top with lettuce, tomato and onions. I didn’t have cumin so I used this spicy curry blend that was amazing in this recipe. I will definitely make this again but with a few tweaks, it felt like it was missing something. I’d cut the parsley in half and up the seasoning a bit. I felt it needed something like diced red bell pepper in the batter and maybe green onions? Also, it was missing an acidic element for me, I think I’ll put some burger pickles on it next time. Still loved this!! Thanks. I’ve tried these and they are absolutely delicious! My little brother enjoyed eating them and is always telling me to make them! Thank you for this amazing recipe! I tried these last night and they were great right out of the oven, but today when I re-heated them, they crumbled up and I had to eat them with a spoon. They have such great flavor, but do you have any suggestions to making them less crumbly? Hmm, if not vegan, you could try adding an egg for more binding. I was very disappointed in this recipe. I followed it to a tee and the end result was nothing short of bland. I sort of suspected the recipe should call for more seasoning. I guess I should have trusted my instinct on that one. Would not make again. Good stuff =) Thanks for sharing. I love hummus and falafel. I’ve always wanted to make my own and yours look delicious so I’m definitely going to try this one out. I second everything Fran said (quoted below). Super bummed that they totally feel apart, especially since it was probably pretty easily avoidable. Parchment paper might have been better? Just saw your recipe and am going to try it tonight. Can I substitute all purpose flour for the nut meal? Can I just use regular flour or does it have to be nut/GF oat?? I absolutely loves these. YES YES YES. I dream about them at night these days, I think they will become my new date food after this. Can these be frozen and enjoyed later? Can you make these and then freeze them ahead of time for dinners in the future?? 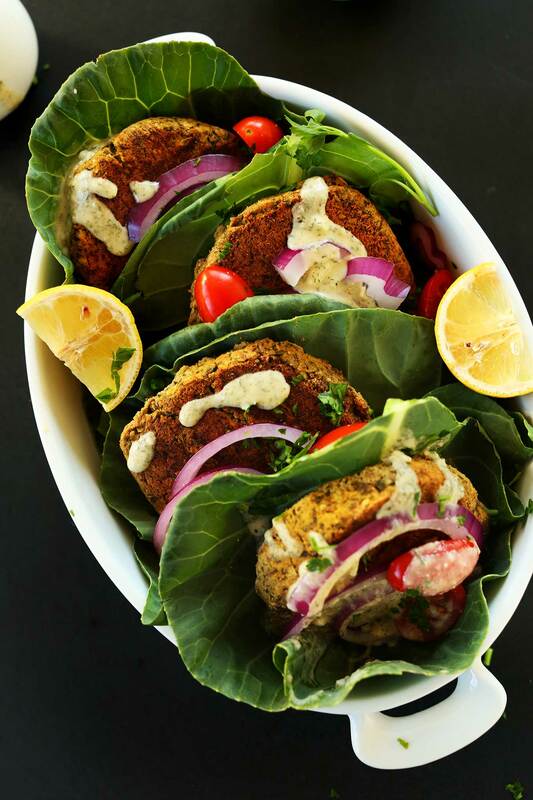 I absolutely loved this recipe, It was my first time making falafel. I am allergic to lemon (strange I know) so I used Apple Cider Vinegar instead, still tasted amazing. I also loved the simple but great Garlic Dill Sauce. Very flavorful. I added a few extra cloves of garlic though. My problem was that these would stay together. So I had falafel crumbles. I made these today! They are delicious! I don’t make sauces much but I am eating a patty in a bowl with diced fresh tomato, avocado and sliced black olives. So good!!! This looks delicious. I am always trying to find alternatives while everyone cooks their meat on the grill. I don’t believe this would hold up well to grilling, but once baked and refrigerated, do you think it is something that could be reheated on the grill? Perhaps on tinfoil? so amazing! my ending up turning out green,lol. I think it was because I was using lightly dried parsley instead of completely fresh. The ratio is different idk why, so I was sure exactly how much to use. Well I used a little too much but I actually really liked them, and so did the rest of my family. Thanks again for the great recipe! I also didn’t pre-fry them and they turned out fine. Little crumbly but that may be due to my parsley situation, but still great! These were amazing!!! We ate them with a yogurt dill sauce since we weren’t worried about making sure the meal was vegan. Will make again yummy. Those falafel burgers looks so good. Just a “stupid” question from my side; is it possible to use a blender instead of a food processor? I’m on a student budget (and a bit short on storage space), so I was just wondering. Of course! Not a stupid question. I used quinoa flour instead and they turned out perfectly for our nut-free house! I also rolled my dough in to quarter size bites so they would be more peckish for salad toppings. This is excellent and easy! These sound great! I am always looking for new veggie burger recipes to try out. I was going to make these to bring to a family bbq tomorrow and was curious how they would do on the grill? I would say OK, but preferable in the oven as they’re a little tender. Wow! This was my first shot at making falafel – it was so easy and so delicious, what a great recipe! They were stuck to the foil, which I had not oiled prior to placing the patties on it. Your recipes always work perfectly. These were dreamy, crisp and sturdy. FYI, I’m a vegan personal cook for a few clients and this particular little gem easily makes it onto the menu almost every week (at the clients’ request!) I have to cook oil-free for one of my clients, so I make all my dishes oil free, and this one turns out just fine. The pan searing (a must in my opinion) is tricky, but can be done with non-stick, then into a silpat lined baking tray for the full 40 minutes. Using this method the burgers come out too dry to serve immediately because the crust is thick and dry for lack of oil. HOWEVER, I serve these to clients who will eat them 12 hours later, at minimum. In a sealed bag, the moisture from the middle of the patty rehydrates the crust and by the time they’re eaten, they’re PERFECT. I tried this today with the Garlic Dill Sauce and can I just say it was magnificent. I’ve been wanting to try making my own Falafel for a while and this was the perfect recipe. So super easy and delicious. Next time I’ll be making a double batch for sure! Wow! This was my first shot at making falafel – it was so easy and so delicious, what a great recipe! I coated a tray with a thin layer of olive oil and baked the falafel burgers with some sesame seeds added to the top for about 30 min., flipping them often, and they were just perfect. Thank you so much! Whoops, I forgot to rate it. Hi- I saw this on Pinterest during a craving for lentil burgers, and tried this instead. So far, so good—they are in the fridge, tasting yummy. I did add some Tahini-we just came back from Israel, so I’m kind of obsessed, but only with the good stuff—it’s amazing what passes for Tahini in the States! I also do love the idea of the green as bun. The bread is always too much for me. These taste wonderful but they TOTALLY fell apart on me in the baking step (I didn’t pre-fry: didn’t want the extra splatter in the kitchen and was going for the healthier option), as I went to flip them over after 20 minutes in. They were stuck to the foil, which I had not oiled prior to placing the patties on it. Is the foil supposed to be oiled? If so, please add that suggestion to the recipe! I’m so disappointed in the complete mess because otherwise they are fantastic. I had the same issue and wished I had given the foil a light coating of non-stick or olive oil. Will definitely try again with that step added in. I turned the next day leftovers into vegetarian chorizo by crumbling and adding paprika, cayenne, and Chollula then I sautéed the mix in a little olive oil. Hello! These were tasty. I ground 1/2 cup of almonds in the food processor. Do you grind some of the garbanzos more so they act as a binder? Mine were roughly chopped and I had a bit of trouble with them falling apart, even after baking. I followed the directions exactly, except cans of garbanzos here have 350g wet weight and 203g drained weight. I googled: 15 oz can are 9.5 oz drained, which is 2 cups of cooked/drained garbanzos. It would be nice to see a shot of your falafel dough if you have it – a visual check on what the texture should be like before cooking! Made this today–it was so so so so good!!!!!!!!! I skipped the skillet part and did not add any oil during the process, but they still came out perfect. I just have a question: I froze some of the raw batter for tomorrow. Do I need to defrost it first or just pop it in the oven? Potentially a silly question – but would you recommend refrigerating/freezing the burgers before or after they’re cooked? Planning on making over the weekend to eat later in the week! Looks amazing! Would a magic bullet work well as a food processor for this recipe? i know i’m late to this awesome post, but is there a substitute for the nuts? Could I just use any gluten free flour, not specifically an oat one? Or gluten free oats? Thanks! Is it okay to use regular whole wheat flour with this recipe? Hopefully this doesn’t seem like a silly question; but when using the parsley, do you add the stems as well? Or just the leaves? I am sorry to hear that Donna! Hmm, if not vegan, you could try adding an egg for more binding. Thank you for your speedy reply. I’ll try an egg next time to bind it. My husband and I made these earlier this week – they were very good and very easy! My primary problem with other falafel recipes I’ve made before is that the patties fall apart easily, but these were very sturdy. I was shocked (and a little appalled!) that the recipe didn’t call for any coriander, however. I added a heaping teaspoon of ground coriander to the falafel mix; I honestly can’t imagine that the burgers would have much flavor without that addition. I also halved the amount of parsley and used regular, all-purpose flour instead of walnuts, etc., and it worked perfectly. I give this recipe 3 stars as-is, or 5 stars with these tweaks! Thanks for a great starting point! Your recipes always work perfectly. These were dreamy, crisp and sturdy. Such a lovely recipe, thank you very much for this. :) Can’t wait to try it out. just made these for dinner and they were delicious! I didn’t follow the proportions too closely, just kind of guesstimated things, and it still worked out great! I was amazed at how well they held together. And I did not fry them in the skillet, just bake them, and they still had a lovely brown, burger like crust. I also threw in a bit of dill, nutritional yeast to the burger, and then added red pepper flakes to the dip for a kick mixed in with all the lovely “cool” feeling flavors. Thank you so much for sharing! Loved it! I think I’m going to try this with lentils instead of chickpeas at some point plus more walnuts and see if they will still hold together. Hmmmmm… but it may destroy the Mediterranean feel to it. I guess I’m just over eager for some great lentil burgers! Anyway these were awesome, thanks again, and I absolutely love your blog! These were so easy and turned out amazing!! The photos looks amazing, if you want the real deal you will have to go all the way to Israel, Falafel is the national dish and Hummus is a national addiction. The hummus became an art form not just food- they treat it as the French treat cheese, it is served warm with toppings in retaurants. 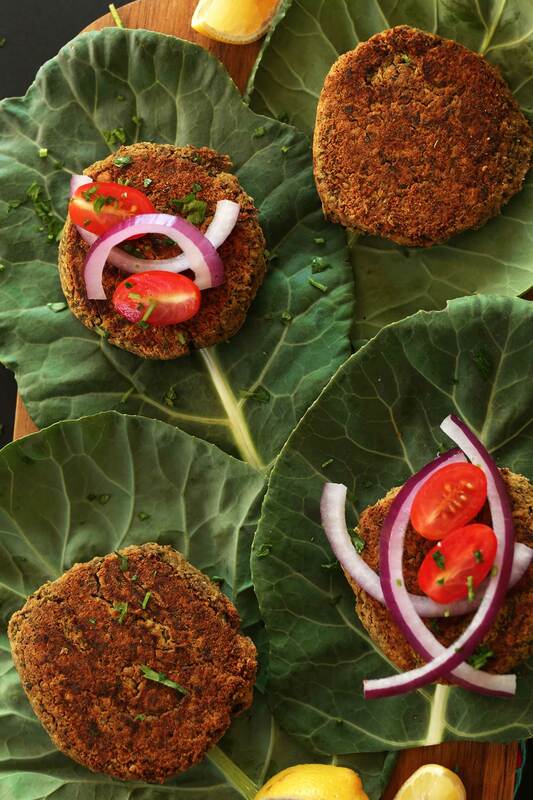 The falafel have many add-ons that upgrade the flavour such as thaini sauce, thinly sliced salad, puffed chip and more. You will find another dishs to the falafel/hummus family like Sabih – pita bread with deep fryed eggpalnt slices with Tahini sauce and salad, and foul- broad bean cooked in hot tahini sauce dish served also in pita bread. Made these tonight! They turned out great! Just made these & they are in the oven. The taste is “on point” for sure. I had a bit of trouble w/ the burgers falling apart. I decided to put them in the skillet 1st, then in the oven to finish. Did I not add enough flour as binder? I added a scant 1/2 cup total of 1/2 coconut flour & 1/2 almond meal, for that is all I had left in the pantry. I would say coconut flour is probably the culprit as it really dries things out. Mmm… Falfael. With burger trimmings. Yippee! I am a massive falafel fan.. never thought to convert the usual falafel ball into a burger though! Definitely a delicious idea that will be making an appearance on my kitchen table… thanks for the great recipe and inspiration! Nom!! I literally JUST had a falafel burger at a great place here in Madison…and as I was stuffing my face, was thinking “this is good, but it’d be amazing to make at home”. Glad we’re on the same page :) Will defiantly reference your recipe for inspiration when I make these in the next few days! Yay! Hope you love them, Annaliese! I love how easy and simple this recipe is! I have just started getting on the ‘hummus bandwagon’ and my family and I all love it. Now I have the perfect ‘excuse’ to make some more this weekend! Thanks Isadora! So jealous that falafel were a part of your childhood. Such delicious little nuggets of goodness! Made lots of falafel but always fried in oil so very keen to try a baked method for them. Way healthier and way less mess. I recommend sauteing these briefly in a “little” oil for that nice crust (as noted), but they mostly get their crispness from baking! Let us know if you give these a try, Elyse! These photos freakin’ rock, Dana. W-O-W. Genius! I’m going to make these for work lunches, as I know falafels are nice and filling! Yum! I could totally get my meat loving husband on board with these and that garlic dill sauce sounds crazy good! These look amazing! I love falafel! There is no excuse not to make them at home now! thank you for sharing, the falafel look very yummy! Yes, from that point of view you are probably correct. We usually call mediterranean cuisine that of countries west to Greece and Cyprus (little meat, plenty of vegetables, legume soups and olive oil). Although, being Greek, I am not even sure we share more with e.g. spanish or Italian cuisine than Israeli or Lebanese. And we definately have more influences from the Middle East, due to the fact that we belonged to Ottoman Empire until quite recently in modern history, and also received many greek refugees from the western coast of nowadays Turkey after World War I. Even within my country local cuisine varies in different places, e.g. it is heavier and more spicy as you move north. I think Middle Eastern is definately more on the spicy side, right? You are absolutely correct Effie! Texture is defintely important. I have made baked falafel before but they were not as crisp on the outside as I would have preferred. Must try these burgers! yesyesyesyesyesyesyesyes!!!! falafel and hummus have my heart. and i am so with you about wanting the substantialness of a burger, especially with the colder days. 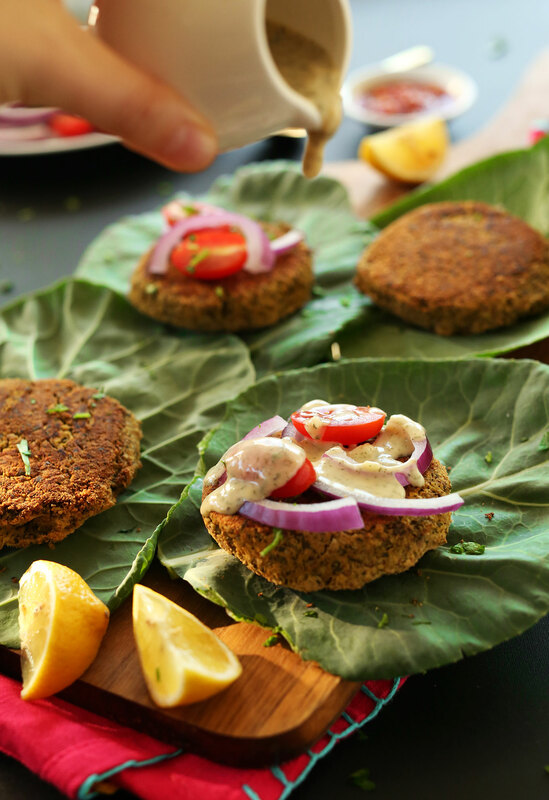 i’ve had a few falafel burgers in my life and they were all so memorable and satisfying. totally adding this to my to make list!!! Yayaya! Thanks lady. Your Shawarma nachos kinda stole my heart. I LOVE Mediterranean food! It’s my favorite. These burgers look delicious! Outside of hummus, I am lost when it comes to Mediterranean food. However, this looks amazing and I would give this a try in a heartbeat! These are super simple and would be a great “next step” in Mediterranean food. Let us know if you give them a try, Joanna! Why must u bake these garbonzo bean burgers so long when the beans are already cooked? Doesn’t cooking them twice destroy the nutritional value? You fry and bake or just bake for 40 minutes? Would 15 minutes work in a hot oven? I bake them for that long because I like a firmer texture. Yes, I’m sure you could just saute them but they don’t get very dry/crispy. I varied a little. Used soaked raw garbanzos and sauted and they.Are.Delicious! Except falafels are specifically a Middle-Eastern food. The Mediterranean encompasses the Levant, as well as European countries. It’s not wrong to call them Mediterranean, but usually food called this way is attributed to Greek and Italian cuisine. It’s b/c of the impassive use of this terminology, people have mistakenly attributed hummus, stuffed grape leaves, halloumi, kebobs, gyros, garlic sauce, baklava, pita bread, moussaka, etc to non-Arab countries. I’m all for the cultural appropriation and assimilation of food, it’s why we can enjoy pizza and sushi. I just hope the cultural integrity of certain food and its history is maintained, is all. Oops. Mistakenly replied to the wrong comment. Nope, it’s not me. It forces me to randomnly respond away from the intended comment I’m directing my post. Weird. Oooh these look perfect! I love everything about this recipe. These look wonderful! I have always wanted to make falafel, and now I have a good recipe! I love that your stayed together so well! Mediterranean food is always enjoyable! Totally my kind of meal. I love the idea of using collard as a bun! I too love the collard bun idea. Use to work on a farm growing collard greens, but I didn’t appreciate them like I do now. Know this is a super healthy dinner but still can’t believe how low calorie this is. Need that right now. And it’s vegan. wow. I’m not strictly vegan but am willing to learn more about it, moving more in that direction.